At Altair, we believe that simulation should drive the product design process. This means bringing simulation into the earlier stages of the design cycle. Every day, our technology and engineering expertise helps small and large companies around the world achieve unique design solutions to meet their performance, sustainability, and budget requirements. We also believe that students are bringing creativity and new technology to industry. No matter what engineering discipline you choose to study, simulation is a key part of overcoming engineering design challenges of today and tomorrow. to improve its ergonomics, performance (e.g. weight, durability), functionality, manufacturability, and sustainability. Apply your knowledge about the Simulation Driven Design Process and prove that your design is better and more innovative than the original by means of simulation using the HyperWorks CAE simulation suite. The 7-month duration of this contest is meant to give you the opportunity to coordinate your participation with your regular studies (e.g. Coursework, Bachelor thesis, Master thesis). Quite obviously, your project is not expected to last that long. 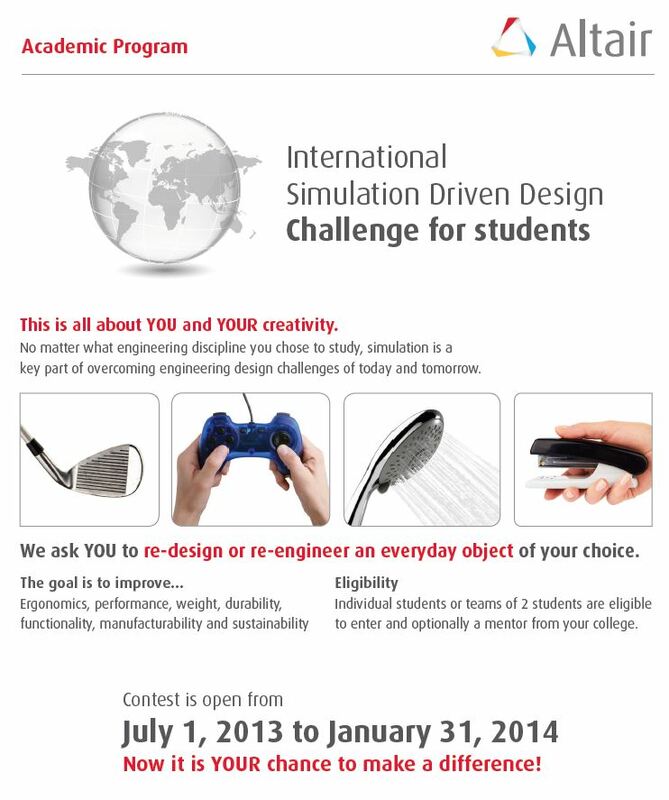 Show us your or your teams’ creativity, curiosity, ingenuity and passion and win one of the various Altair prizes.